On July 3, 2012 I started writing this blog. It’s taken six months of part time posting to reach this, my 50th blog article. So in honor of this personal milestone, I am writing a two-part series on what my experience has taught me thus far about myself and what it has taught me about blogging. Fear can be a paralyzing force in our lives. In my opinion, it is the #1 thing that holds us back from pursuing our dreams. Sometimes these fears can be legitimate, but most of the time they are made up fears in our mind as we contemplate the future unknown or things we can’t control. I know this may sound irrational but I have always feared the posting of personal information online. Spreading one’s thoughts all over a web page is pretty personal because it reveals who you are. To have those thoughts critiqued, judged or questioned by others can be very intimidating. I mean really…who needs to put with all the comments from people ripping your post apart? I had to come to grips with this and work through it. So how did I overcome this particular fear? I let passion push me. I never thought blogging would become a passion. It has become that however, because it is serving as a natural outlet for another passion – a desire to help others by revealing my own personal finance journey. Passion can drive us to do great, crazy and dangerous things. In this case, my passion for helping others pushed me passed the fear I mentioned above. In the end, I finally realized if I wanted to have an impact, I had to push the fear aside and take some risk. Once you realize you have a passion, my advice would be…well, the next thing I learned about myself. I am conservative by nature, slow paced, preferring to have everything lined up before I start a project. I don’t like going into things blindly without logically thinking through all the minute details. I like stable, predictable environments that move slowly, step-by-step. I am the perfect “S” profile on the DISC personality test. She was right. It still frustrates me that I haven’t had time to work on that stuff yet, but I’ve realized its more important for me and my readers to produce valuable content first. All that other stuff can come later. We sell ourselves short all the time by thinking we don’t have the ability to move beyond where we are. I didn’t think I could set up and manage a basic website, but I was wrong. I didn’t think I would have enough time to write a blog, but I was wrong. I didn’t think I could be this creative, but I was wrong. I didn’t think I would like interacting with other bloggers, but I was wrong. I didn’t think this would be that rewarding, but I was wrong. Don’t believe it the next time your mind says, “You can’t do that.” Your mind is wrong. I’ve learned a great deal about myself in these first 50 posts, but I’ve also learned many things about blogging. I’ll share that in my next post. 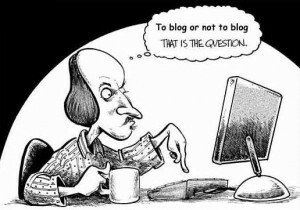 Do you remember your first days of blogging? What was that like for you? What have you learned about yourself in the process? Everything you’ve said is certainly true. I was terrified to put myself out there, but when you think about the worst thing that could happen (no one reads it or they might read it and tell your it’s awful), that’s really not so bad. I’ve also found if I write it and share it, it’s much more likely to happen. I agree. There is a different level of intensity that surfaces by putting what you have been thinking about down in writing. Makes the idea seem more concrete and that sort of pushes you to follow through. congrats on your 50th blog post keep going. Thanks. It has been fun.